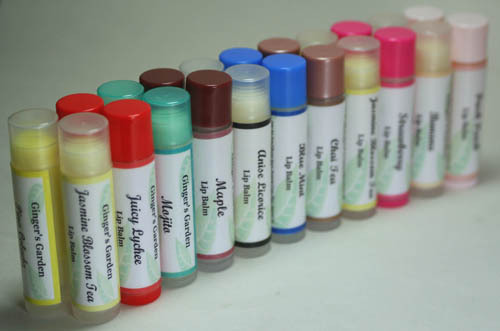 Handmade Lip balms are a mixture of soft or liquid oils, solid oils or butters and a wax. They soothe and moisturize the lips, keep it soft, moist and help with chapping and dryness. Lip balms protect the skin from extreme environments or weather changes like wind, snow, cold or the sun. If you are making your own lip balm, you have many natural choices available. The benefits of using or making your own lip balms are pretty obvious. Using natural oils or butters with no chemical ingredients (like mineral oil) are better for the lips and better for the environment. Since natural lip balms contain no water, preservative is not needed. Well made lip balm goes on easily in most temperatures, creates a soft protective film and goes on evenly without tugging. It should feel soothing without being sticky, long lasting with a pleasant taste or flavor and of course, hydrates the lips. Depending on the formula, lip balm can be either matte or shiny. I prefer not to use hemp seed oil as it has a short shelf life. If you are making a lip balm just for yourself, then hemp oil is fine. You can use soft or liquid oils like olive, coconut, almond, grapeseed, apricot kernel, castor oil, jojoba oil, soybean, sunflower or avocado oil. Solid oils or butter that are used in homemade recipes include high degree coconut oil, cocoa butter, shea butter or mango butter. Most handmade lip balms contain beeswax as a hardener. If you prefer a vegan version, you can use candelilla or carnauba wax. · Olive oil is the heaviest oil in lip balms. It can be greasy and feel heavy on the lips. · Avocado oil is the next heaviest on the list. · Castor oil used in higher amounts creates a shine on the lips. Use this oil if you want your lip balm glossy. Be aware that castor oil could make the balm sticky. · Jojoba oil is a nice addition to lip balms. Technically it’s not an oil, but a plant based wax that’s liquid at room temperature. It helps to create an occlusive layer on the lips to protect them. I use jojoba oil as it gives the final formula a nice feel. · Coconut, almond, grapeseed, apricot kernel, soy bean or sunflower are lighter weight oils and make good choices in natural lip balms. They hydrate the lips and do not feel sticky. These oils do not add shine. · Cocoa butter is a natural botanical vegetable fat. It comes from cocoa beans. Cocoa butter is harder then shea butter or mango butter. It is a solid at room temperature, but melts easily with skin contact. It is used in a lot of cosmetic based products and of course chocolate. It has a pleasant chocolate aroma. Unrefined cocoa butter smells very sweet and chocolaty. Refined has a milder scent and flavor. If you are leaving your lip balm unscented, it’s better to use the unrefined. Refined is better in formulas that have added flavor or essential oil. · Shea Butter is harvested from the African karite or shea tree. Unrefined can be beige, yellow, tan or have a light green tinge. Some unrefined shea butter has a lightly smoky smell, since the crushed nuts are cooked over an open fire. My preference is refined shea butter as it doesn’t add a smoky scent or color. Refined shea butter comes from cooking unrefined shea butter with clay. · Mango Butter comes from the natural botanical fat of the fruit of the mango tree. It is a soft solid at room temperature, but it’s softer then cocoa butter. It melts with contact on the skin. The scent is very mild and pleasant. · Beeswax adds hardness to the formula so it doesn’t melt in your pocket or purse. For a vegan version, use Candelilla or carnauba wax. · Candelilla wax is a hard wax that is made from the leaves of the Candelilla shrub. It adds a nice slip and lubricity to a lip balm formula. Due to its hardness, it’s used at a lower percentage then beeswax. · Carnauba wax is a hard botanical wax from the leaves of the carnauba palm. Carnauba is harder then beeswax. It is a natural ingredient that’s used in car polishes as it helps protect the car’s finish. It is also an ingredient in candy. You can leave your lip balm unscented, add a food grade essential oil or a flavor oil made for lip balms. If you add essential oil, make sure that you purchase it from a reputable vendor and that it is GRAS (generally recognized as safe). Not all essential oils are safe to use on the lips as they could be irritating. They will also be ingested in small amounts. So take that into consideration. Some citrus oils like orange essential oil are sensitizers in the sun. This means they can give you sunburn on your lips. If you are making just a small batch for yourself, using teaspoons is ok. You might not be able to replicate what you made each time and that’s fine. I prefer to weigh everything. I feel it’s best to weigh all your ingredients so you can achieve the same exact recipe or formula time after time. Keep good notes so you can repeat the same thing each and every time. Here is a sample formula. Feel free to play around with it until you get the texture and hardness that you like. The nice thing about this formula that if you don’t like it once it hardens up, you can gently remelt it and add more liquid oil to make it softer or add more wax to make it harder. 3.2 oz. Olive, Almond, Avocado, Apricot Kernel etc. Add all the ingredients together. Gently melt on top of the stove, or in a microwave safe container in the microwave. For the microwave, heat in short bursts, until almost all of it is melted, then stir the rest of the way. When the ingredients are melted, stir with a small spoon (NOT plastic). Pour into a clean metal tin, a lip balm container or a small plastic jar that can withstand heat, or glass jar with a lid. Let harden at room temperature or carefully place in the refrigerator until the balm hardens. The final texture might take up to a couple of days, so don’t judge the lip balm right away. I would use about 10 -20 drops of essential or flavor oil if you are adding flavor. If you are adding an essential or flavor oil, let the lip balm cool slightly; stir the flavor into it well, then pour into your chosen containers. I haven't ventured outside of beeswax, cocoa butter, and coconut oil in equal portions, but I am going to give your recipe a whirl! Really interesting post. I am always looking for natural solutions to the harsh winter environment here in Colorado.